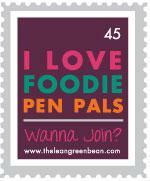 In the last few months, I have been participating in a round up called Foodie Pen Pals. Basically each month I am pared with two people: one I send a package to, and the other sends a package to me.This month, I got a package from Edmonton, Alberta and sent one to St. John's, Newfoundland. My package from Lisa came Thursday the 20th of September, it was a rainy day and I was packing up my kitchen. We moved this past Saturday, so it has been an adventuresome month! Like me, Lisa is about 5 months pregnant, so she sent me some goodies that were both healthy for baby and delicious for me. I had to wait for the next sunny day to take my pictures, and I apologize for the poor quality, it has been a hectic couple of weeks!! First up is a box of Pumpkin seed cheddar crackers. As you can see, I have already gotten into them. When the box came, I was mid-packing, and hungry! I thought they were granola bars, so i tore into the box! I was surprised when I found crackers! I was not feeling crackers just then, so i closed it up and dug further into my package, I have since tried the crackers, they are delicious and a brand I have never seen here, yum! Next is a box of Mandarin Orange Spice tea, I love the smell! I have not opened it yet, I am saving it for my new kitchen (and my kettle was and still is packed, the downside of moving). Cashew Carrot Ginger soup, it looks delicious, but again, I have not had the chance to get into it. The next rainy day (so looking like Wednesday), this will be lunch! I have not seen this brand around here either so I can't wait to try it! And finally, a dark chocolate bar, some recipes for my new kitchen, a painting and a CD! Here is a link to Lisa's Music webpage http://www.lisanicolegrace.com/, check it out! Well, that's it for this month, I am still debating on participating in October, where everything is such a mess right now due to moving I'm not sure if I will have time, so if not I can't wait for November to get more goodies!! If you are interested in participating in October, click HERE!